With its top ten wines by Quality score costing £225 per bottle on average, Piedmont might seem overindulgent for a low key midweek meal. However, with a little bit of help in the shape of Wine Lister’s Value Pick search tool, it is easy to find wines that will deliver maximum enjoyment at reasonable prices. Value Picks represent the very best quality-to-price ratio wines, with a higher coefficient applied to allow exceptional quality to be recognised. With a remarkable average Quality score of 976, and costing £40 on average, these five Piedmontese wines prove that outstanding quality is available at all price points. 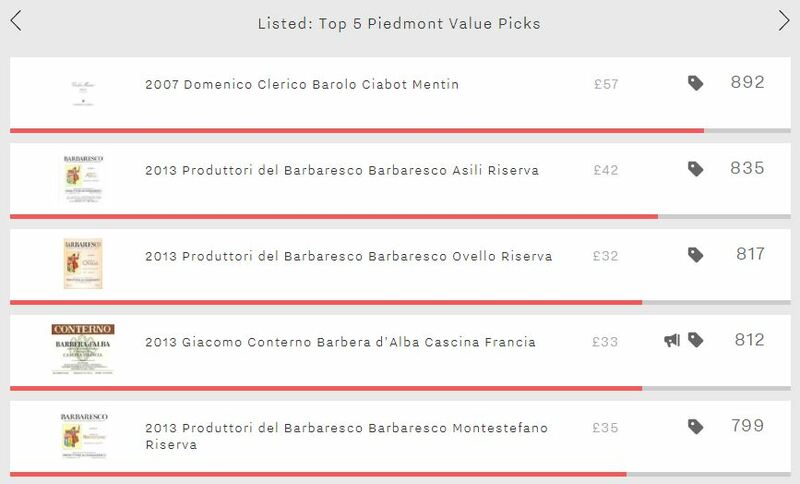 If you’re after top Nebbiolo at a fair price, then Produttori del Barbaresco’s 2013s appear a safe bet, filling three spots. However, the trade-off for top value will be patience – none of the three will enter its drinking window until 2023. However, with each of them lasting over 18 years, you will be able to make the most of your prudent purchases for years to come. And what better way to explore Barbaresco’s crus in an outstanding vintage than with these three? The Asili Riserva achieves the top Quality score of the three (987), 75 points above its wine-level average. It is also the most expensive, but £42 per bottle doesn’t seem unreasonable for such quality. The Montestefano Riserva really outperformed in the 2013 vintage with a Quality score of 972, 125 points above its average score. The market is yet to react – the 2013’s price is currently 16% below its wine-level average. Proving that if you’re looking for value for money in Piedmont, it’s not just Barbaresco that you should look out for, Domenico Clerico Barolo Ciabot Mentin 2007 is the region’s number one Value Pick. With a Quality score of 989 – thanks to a 98 point score from Antonio Galloni – it is not hard to see why. What’s more, whereas the Produttori del Barbaresco 2013s require cellaring, the Ciabot Mentin is just entering its drinking window. Showing that Piedmont is not all about Nebbiolo, Giacomo Conterno’s Barbera d’Alba Cascina Francia 2013 fills the remaining spot. The group’s only Buzz Brand, this would be an excellent way to sample one of Giacomo Conterno’s wines at a fraction of the cost of the domaine’s top cuvées – the hallowed Monfortino Riserva costs £608 per bottle on average.